YES! You are the Famous Amos Cookies!!! Am I mad or something? Nay... I'm just too happy because I have been trying very hard to replicate the Famous Amos chocolate chip cookies and have finally derived a recipe!!! 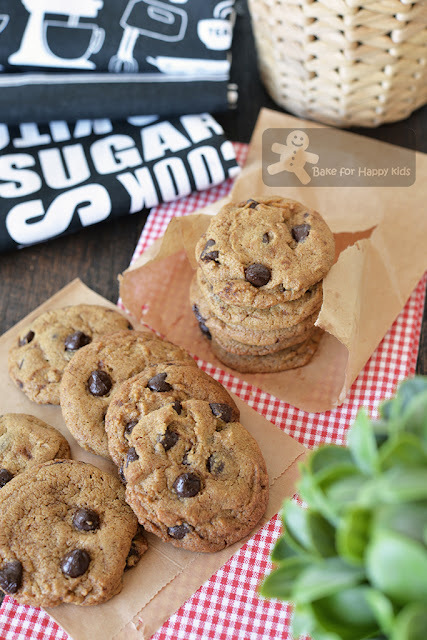 A recipe that makes the BEST copycat crispy Famous Amos Cookies! These are my BEST copycat Famous Amos cookies! It is true that they really smell and taste like the FA chocolate chip cookies. How did I bake these yummy cookies? Let's recap on what I did previously at here. To investigate further, I have standardised two plus more recipes to try... Significantly, one has shortening and the other one has vegetable oil. Both recipes use 2:1 fat:sugar proportion and 2:1 brown sugar:caster sugar proportion. Although both recipes are good producing crispy and delicious cookies, they are just not Famous Amos enough!!! The baking of these cookies didn't release any irresistible sweet buttery toffee-like aroma! More sugar means more crispy cookies? Despite that the sweetness of these cookies are just right for us, these cookies need to have MORE sugar to be MORE LIKE the Famous Amos ones. The cookies are way too pale as compared to the real Famous Amos ones. (1) Increase the proportion of butter:shortening to 2:1 to increase the buttery aroma in the cookies. (3) No change in 2:1 brown sugar:caster sugar proportion but must use DARK brown sugar instead of light brown sugar. True enough!!! ... that butter, vanilla and DARK brown sugar are the magic ingredients for baking these cookies!!! These improvement (1), (2) and (3) have made the cookies releasing so much more irresistible sweet buttery toffee-like aroma during baking! Yes... This is THE smell that lingers along the basement walkway in between Wisma Atria and Takashimaya at Singapore. THE smell that says "You want to eat FA cookies NOW!!!" or "Buy me! Buy me! You want to eat me!!!" If you are a fan of FA cookies, I know that you know what I meant. 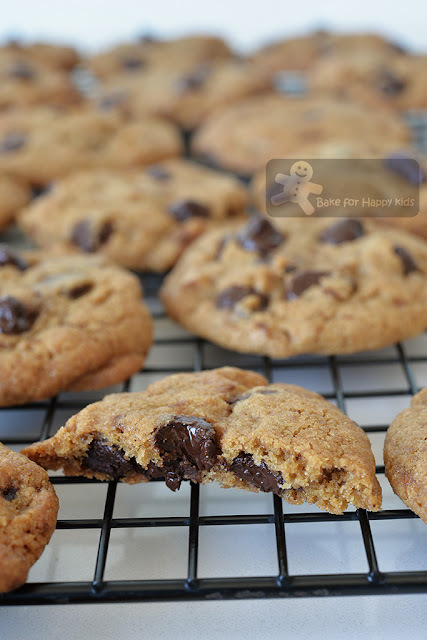 (5) Need to add more salt into these cookies because salt can enhance the sweetness and other flavours in these cookies. Hey! It's true!!! This is how most food companies make their food so yummy! 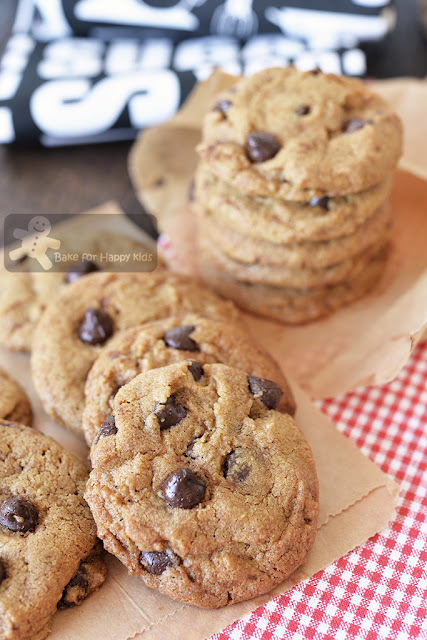 These chocolate chip cookies with more butter smell and taste a lot like the crispy Famous Amos cookies but if you are extra extra extra critical like us, you will taste that they are also a little chewy in the middle and they tend to spread a little more than the real Famous Amos cookies. Not the best but can pass lah! And I will tell you later why I'm still sharing this recipe. My copycat Famous Amos Cookies made with recipe one. ... but they are a little chewy and spread a little more than the real Famous Amos cookies. These buttery cookies are slightly thinner than the regular FA cookies. And they smell and taste really really really good! Crispy on the outside and slightly chewy in the middle. These are the BEST Famous Amos chocolate chip cookies that I have ever baked!!! 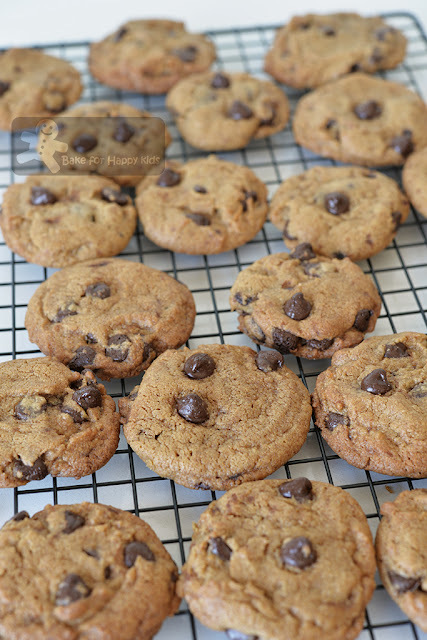 To me, this is the recipe that makes the BEST copycat crispy Famous Amos Cookies! Totally crispy with irresistible sweet buttery toffee-like aroma! ULTIMATE YUMMY when the chocolate chips are still melty! OH!!! Some of you might ask... Why bake your own cookies if you can buy them from Famous Amos? Totally agree but my son tells me that my home-baked cookies are always better than many commercially made ones because he knows that I always bake my cookies with gourmet Callebaut chocolate, muscovado sugar and real vanilla bean or paste. Do you think that the Famous Amos will use these ingredients? By the way, there is no Famous Amos Cookies in Melbourne... And it is a good thing for us now that I can bake Famous Amos cookies at the comfort of our Melbourne home. My recipe TWO makes the best copycat crispy Famous Amos Cookies! If recipe TWO is the best, why do I still need to mention recipe ONE? Despite the fact that cookies made by recipe ONE is a little less like the Famous Amos Cookies, my son told me that he like these cookies more!!! Even more than the other crisper ones!!! Huh??? With 1:1 fat:sugar proportion in the cookies means that these cookies are actually more buttery than being sweet. So, you can imagine... they are very yummy too!!! Hence, I will share this recipe even though the cookies are a little less like Famous Amos. Me Me Me Me Me!!! You? 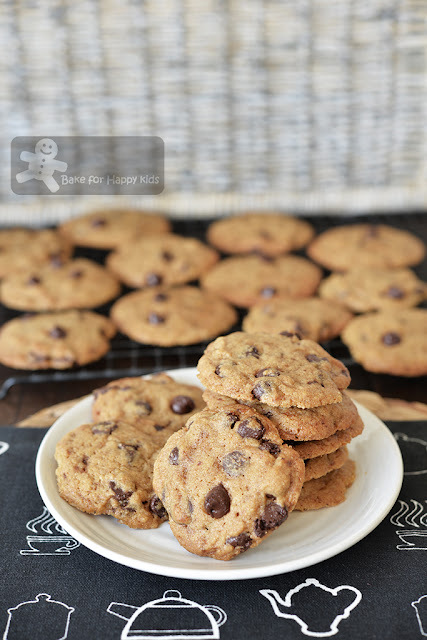 To me, these buttery, crispy and slightly chewy cookies are 80% like the Famous Amos ones! To me, these crispy and aromatic cookies are 99.99% like the Famous Amos ones! Thank you!!! Thank you for your support!!! However, if you think that my recipes can't bake cookies that are Famous Amos enough, please check out other recipes. I'm sorry that I can't help you any further. Cheers! Please note that any substitutions or changes in any recipe can alter the overall texture of these cookies and can eventually make them less or "maybe more" Famous Amos. So please do not ask me if you can substitute or reduce this or that for these recipes. Please do whatever you like and like whatever you did! Happy Baking and enjoy these cookies!!! 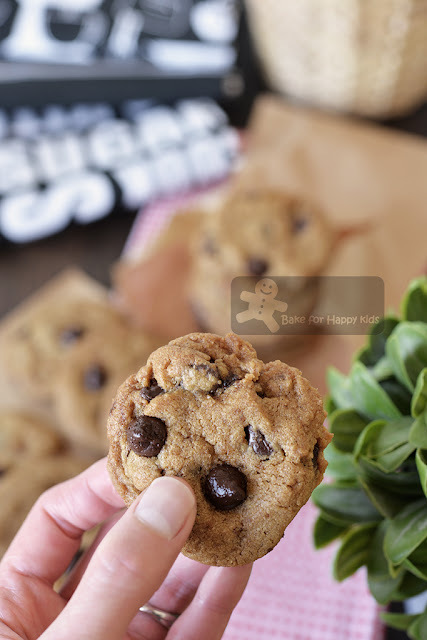 THIS IS THE BEST COPYCAT FAMOUS AMOS CHOCOLATE CHIP COOKIES RECIPE! *Please do not use Copha shortening or substitute this with butter or vegetable oil. 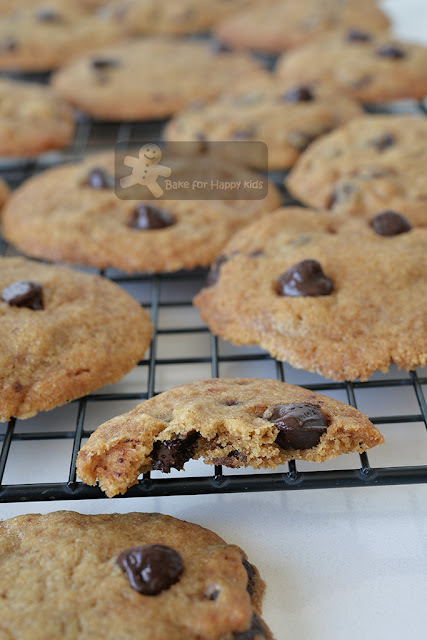 This ingredient is essential to make these cookies very similar like the Famous Amos Cookies. For people who are living in Australia, you can buy this item via USA foods, online or in the shop at Moorabbin, Victoria. Using a wooden spoon or an electric mixer with paddle attachment, beat butter, shortening, dark brown sugar and caster sugar for about 2-3 mins or until combined and fluffy. Add egg into the butter mixture bit by bit, beating well after each addition. Add vanilla and beat until combined. Combine flour, baking powder and salt. Sift flour mixture into the butter mixture and use a spoon or spatula to mix until all ingredients are well incorporated. Then, stir in the chocolate chips. Transfer cookie dough onto a plastic wrap and use the wrap to press and knead the dough together. Wrap the dough with the plastic wrap and let it to rest in the fridge for at least 3 hrs or until it is totally firm. Note: Due to the different amount of butter and shortening added, the dough made with recipe One will be a lot more softer than the dough made with recipe Two and so it will need at least 3 hrs to chill the dough until firm. Drop 1 tablespoonful of dough onto the prepared baking trays, about 5 cm / 2 inches apart. Use the back of a metal spoon to flatten the cookie dough slightly. Top each cookie dough with more chocolate chips if desired. 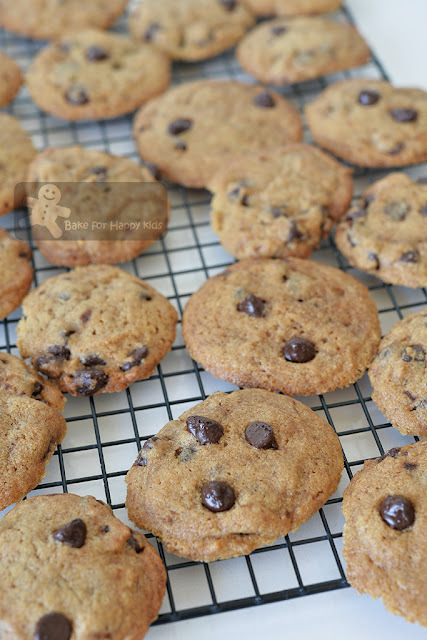 You can also top the cookie dough with chocolate chips first, then use a spoon to flatten the dough later, vice versa. Bake for 14-15 mins or until the edges of the cookies are firm. Do not under-bake the cookies if you want the cookies to be crispy. Allow cookies to cool slightly on the tray for 5-10 mins, then transfer onto wire racks to cool completely. The cookies are a little soft when they are freshly baked and will become crispy when they are completely cooled. Store any uneaten cookies in an airtight container at room temperature for up 5 days. hi...your cookies look yummy.wish to try out.may I know if I can omit the shortening? My aim is to bake cookies that are like FA. Hence, I said in my post" Please note that any substitutions or changes in any recipe can alter the overall texture of these cookies and can eventually make them less or "maybe more" Famous Amos. So please do not ask me if you can substitute or reduce this or that for these recipes. Please do whatever you like and like whatever you did!" I would like to bake this FA cookies for CNY. How to store more than 2 weeks keep fresh? Hi, Even the real FA cookies (even those opened from a foil pack) will lose its freshness if they are kept for more than 2 weeks... so why do you want keep these nice cookies for too long? Thank you for sharing, i will try your recipe! Do u think adding coffee oil or even cinnamon powder will bring it closer to the Famous Amos aroma? Hi Helen, Thanks for your suggestions. You can add these ingredients if you wish but I still think it is the vanilla and brown sugar that make the signature FA aroma. Cheers! Hi Zoe, do u use egg yolk only for the 15g egg? Do you use TOP and bottom heat to bake the cookies? Thanks a lot. Hi Grace, 15g egg is the whole egg including egg white and yolk, not egg yolk only. Yes, I'm using oven setting with top and bottom heating. Not fan forced. Cheers! Hi Zoe, thanks for sharing. Hi, Nice to hear that you like this recipe. I think you might have over-baked your cookies as their base shouldn't be too brown. Try baking with slightly lower temperature and adjust the baking rack to be in the middle of the oven. Bake one tray at a time if your oven is too small or has uneven heating. Cheers! zoe.. really enjoying your blog, so this recipe do need shortening? as u know so hard to get crisco or good shortening, how can I substitute? Hi, do you think it is possible for me to chill the dough in the fridge overnight before baking the next day? Yes! You can do that! Happy Baking! Can I don’t chill the dough and just bake it directly after the steps? The cookies will spread more and change the texture slightly if the dough is not chilled before baking. Hi Alexis, Nice to hear that you like the recipe :) Cheers!